Not all of Michigan’s great hikes are trails. This trek is a journey through Silver Lake State Park's trailless backcountry, a mile-wide strip of dunes between Silver Lake and Lake Michigan. There's not another hike like this in Michigan or even the Midwest because no other stretch of dunes are so barren. Perched on a plateau and rising more than 100 feet high above Silver Lake, the heart of these dunes are totally devoid of any vegetation, even dune grass. 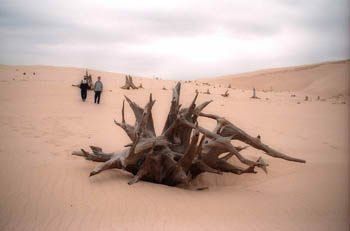 The only thing besides sand are the stumps and trunks of ghost forests, ancient trees that the migrating dunes had buried and killed. Not all of Michigan’s great hikes are trails. This trek is a journey through Silver Lake State Park's trailless backcountry, a mile-wide strip of dunes between Silver Lake and Lake Michigan. There's not another hike like this in Michigan or even the Midwest because no other stretch of dunes are so barren. Perched on a plateau and rising more than 100 feet high above Silver Lake, the heart of these dunes are totally devoid of any vegetation, even dune grass. The only thing besides sand are the stumps and trunks of ghost forests, ancient trees that the migrating dunes had buried and killed. Almost half of the hike is in this Sahara Desert-like terrain, the other half is spent strolling a stretch of Lake Michigan that is free of cottages and frozen custard stands. In all Silver Lake State Park contains 2,936 acres, with 1,800 of them located in the backcountry between the two lakes. The strip of dunes is divided into three areas. 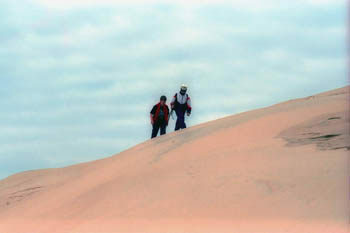 Small sections at the north end are designated for off-road vehicles, and the south end is used for the famous Mac Woods’ Dune Rides (231-873-2817;www.macwoodsdunerides.com). But most of the acreage lies in the pedestrian area, where hikers follow the ridges of open sand out to Lake Michigan. The state park also contains almost 4 miles of Great Lake shoreline, a wide sandy beach that is rarely crowded. Ironically the east side of the lake is a tourist mecca; a bumper-to-bumper row of motels, ice cream stands, water slides, and souvenir shops. The state park campground, featuring 200 modern sites, is also located here, and the demand for sites is heavy to say the least. This hike begins with a trek across the dunes and then continues along Lake Michigan to historic Little Sable Point Lighthouse. From there you loop back through the open dunes to the trailhead. The total distance ranges is generally 7 miles but that depends on the exact route you choose through the dunes. The hike can be done in light walking shoes, even running shoes, since it's easier to dump the sand out of them, but not in bare feet. Don't forget a hat, sunscreen, and a water bottle as trekking through the sand can be hot work in the summer. The route begins with a short trail through a oak/maple forest marked in the parking area by a "Dune Access Stairway." From the wooden staircase you come face-to-face with a 50-foot high wall of sand that is so steep it's literally pouring into the forest. The climb to the top is a knee-bender and only the first of many. Once on top you're rewarded with a view Lake Michigan on the horizon, Silver Lake to the left and sharp ridges of sand right in front of you. To reach Lake Michigan, select one of the ridges and begin scaling it. The dune ridge just to the south is visibly higher than those around it, and from its sandy peak you are rewarded with the best view in the park, overlooking both Lake Michigan and Silver Lake. The dunes here are some of the most amazing ones in Michigan. They run east to west for the most part, and some tower more than 130 feet above Silver Lake. The sand is pure, sugar-like, and there's not a plant around, not even dune grass. The sides of the dune, sculptured by the wind, form steep slopes with an incline of 45 degrees or more, while the surface at the top has a rippled wave-effect to it. In the toughs between the dunes are gray, stark trunks of ghost forests. After trudging along the crest of the dune, you descend to the section where grass has taken root, within 0.7 mile from the trailhead. Although the area is trailless, several routes are visible through the grass and lead into the strip of oak and jack pine. After a a half-mile walk through the lightly forested strip, you undertake another short climb through wind-blown and grass-covered dunes, and end up on the edge of a sandy bluff looking down at the Lake Michigan beach, usually reached in 1.6 miles from the trailhead. The trek continues by heading south along the Lake Michigan shoreline for an easy and interesting hike. On one side is the endless blue horizon of the Great Lake while at your feet is a beach covered with tracks from a variety of wildlife. 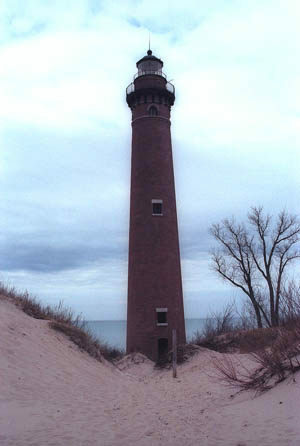 Within a mile Little Sable Point Lighthouse comes into view to the south and after 2 miles you arrive at the mouth of Silver Creek. Kick off the shoes and cross the shallow stream. On the other side is Golden Township Park and Lighthouse Drive. Followed the paved road for 0.3 mile to reach the lighthouse, a photographer's delight that was built in 1873. The state park day use area is roughly a 4-mile hike from the trailhead and has bathrooms, making it ideal for an extended break or lunch. The second half of the hike begins by backtracking Lighthouse Drive, passing up Golden Township Park and continuing along the road as it skirts the south side of Silver Creek. Within 0.6 mile, or just east of the Silver Lake Channel Dam, is Ruckel Bridge that can be used to cross the stream. Once on the north side you’re faced with another gut-busting climb to return to the top of the open dunes. At the top, work you way northeast across the dunes towards Silver Lake. Again there are no trails but from the perch of any high dune you will be able to see Lake Michigan, Silver Lake and pair of posts topped off with bits of colored cloth. These are markers for the Mac Woods dune buggies and can be used to stay on course. By hiking towards the posts grass covered dunes will give way to huge blowouts which give way to those long ridges of pure sand. In final mile of the trek, you will climb and descend four such ridges, each a little higher than the last until you are perched on the highest grain sand in this park. From here you be able to view the ORV area of the state park to the north as well as a small trail sign pointing to the stairway that was climbed at the beginning of the hike. The Dune Pedestrian Parking Area contains vault toilets, picnic tables, grills, and a hand pump for drinking water. The Silver Lake State Park campground is a modern facility with 200 sites on both sides of County Road B15. Advance reservations (800-447-2757;www.midnrreservations.com) are often necessary for summer weekends. 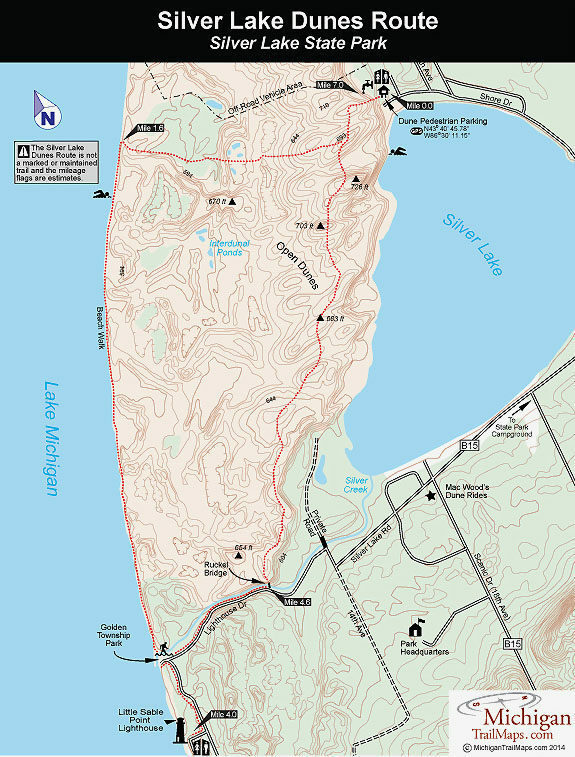 The state park is south of Ludington and can be reached from US 31 by exiting at Shelby Road and heading west 6 miles to County Road B15 (18th Avenue). Head north (right) for 5 miles. At silver Lake County Road B15 swings follows the east shoreline, past the state park campground, then heads east toward Mears. Where County Road B15 merges with Hazel Road, turn west (left) onto Hazel Road and follow the "ORV Access Area" signs. These will lead you to the Dune Pedestrian Parking Area, well posted and located right next to the huge lot where off-road vehicle users park their trailers and rigs. Just before County Road B-15 reaches Silver Lake, you pass the park headquarters (231-873-3083), where additional information can be obtained.